The global network for anaerobic fungal knowledge, research and communication. Please check out our facebook page for a recent video that was shared there regarding rumen fistulation. Rumen fistulation is a key methodological approach used to understand the role of anaerobic fungi (as well as other microorganisms) within the rumen. There are many different feelings about these kind of approaches, but I would just like to highlight the only other alternative way to obtain a representative rumen digesta sample is to euthanize an animal every time a sample is required. Therefore rumen fistulation is not only a key experimental tool (enabling repeated and/or temporal sampling of the rumen) but enables minimisation of the number of animals used in research without compromising the ability to deliver applied outcomes that have a real impact in terms of food security and environmental footprint. At the recent ISAM-9 symposium there was much interest in anaerobic fungi across a range of applications from novel metabolite production, biogas production, methane mitigation and bio-remediation. There was also an informal network get together organised at the conference (big thank you Tony Callaghan!) where a variety of different anaerobic fungal interests and topics were discussed. Colin Orpin loved Tony Callaghan’s figure as it showed both the basic morphology of a mature plant and the growth of the germinated zoospores that had invaded the plant tissue. It also nicely demonstrated both ‘ends’ of the vegetative stage of the growth cycle. The network recently held a photo competition, which Colin Orpin kindly agreed to judge. Colin had 59 entries to choose from and paid particular attention to the quality of the image, its significance and originality. I am delighted to announce that Tony Callaghan from Aberystwyth University was placed first (see new image on our website). Oontomyces – a brand new genus! Delighted to announce the publication of a brand new anaerobic fungal genus: Oontomyces! That’s eight genera now…Perhaps one of the most intriguing things about this genus is that it appears to be camelid specific. Further details about the new genus can be found in the recent Fungal Biology paper where its discovery was reported. Abstract deadline closes 30th April! Direct fed microbials (essentially similar to probiotics but the term is only used for “live, naturally occurring microbes”) are an approach to beneficially modify the gut ecosystem to optimise animal health and/or productivity. A recent review covers this topic from the perspective of ruminants, and highlights the significant value and future opportunities for anaerobic fungi as a live microbial feed supplement. What’s better for ruminants than having ruminal anaerobic fungi? Having even MORE ruminal anaerobic fungi! A recently published study reports that certain plants can promote anaerobic fungal growth/activity, and may have potential as a future feed additive. There will be a Hungate1000 rumen microbial genomes workshop taking place at the 2015 Congress on Gastrointestinal Function Conference, April 13-15, Chicago, USA. Click here to see a video clip of a Buwchfawomyces eastonii thallus attached to a particle of wheatstraw. 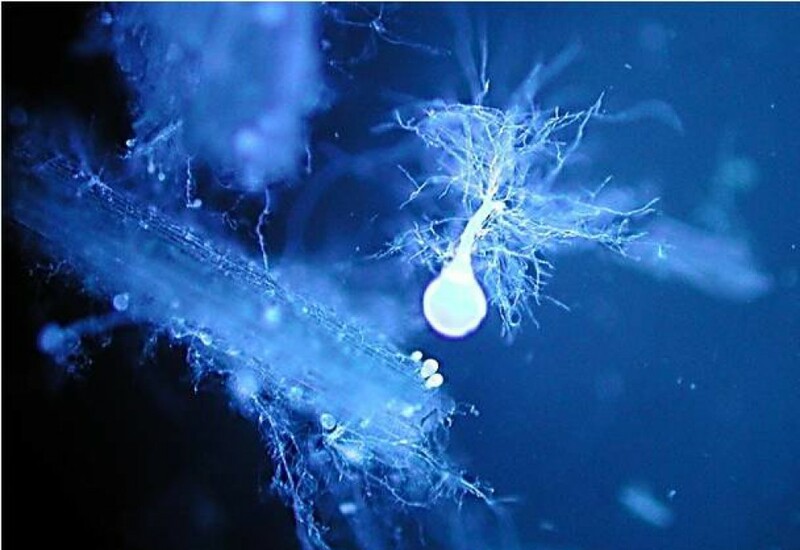 The wheat straw particle can be seen to be colonised by the extensive rhizoid which has a mature sporangium (round bulbous structure) emerging from it. The sporangium will eventually full up with zoospores and release them to colonise fresh plant material. Thanks Tony Callaghan for providing us with this video clip!